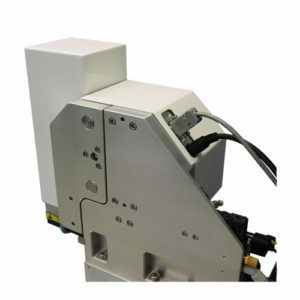 The PL165 Applicator is available with a Side Scan Tamp module. The PL165i-SS or the PL165EPi-SS can be selected for your application. The Side Scan Tamp module provides an additional axis of motion control to allow the Tamp to move on a horizontal plane. This module is typically implemented for applications in which the die-cut adhesive components may include variation in the position on the liner in the non-feed or cross-web axis that exceeds the allowable specification for the assembly. The Side Scan Tamp includes a sensor that is used to register the edge of the adhesive component in the cross-web axis so that the system can automatically correct for the position of the component.